When people have conversations, they take turns speaking and listening to each other. This kind of collaborative turn-taking is a key feature of human language and communication. 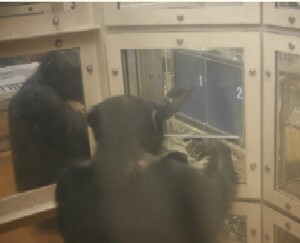 To explore the evolutionary nature and history of turn-taking, we examined behavioral coordination in chimpanzees-- the closest living relatives of human-- using a shared touch-panel task. 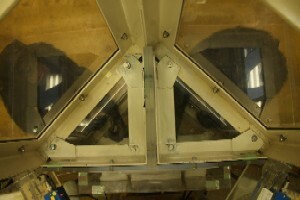 Pairs of chimpanzees sat at a shared touch-panel station (See photos of Arena and Fig1), where each individual could reach half of the screen. 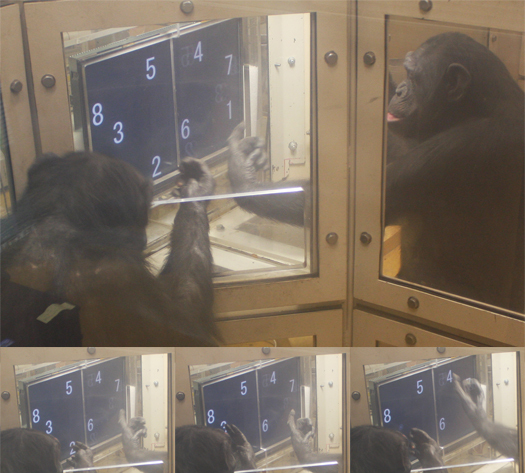 Numbers appeared across the whole of the screen, and the chimpanzees were required to "take turns" pressing the numbers in the correct order. They were already experts at touching the numbers in the right order, but they had never been given this "shared" version of the task. Four of the six subjects spontaneously performed the task at a high level during the training phases (See video of training phases), which suggests turn-taking is naturally part of their behavioral repertoire. 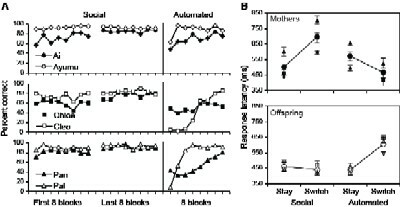 When given 8 numbers on the screen (See video of 8 number task), the subjects performed at a high level (See Fig 2), and the young subjects made fewer errors and were faster at responding compared to their mothers. 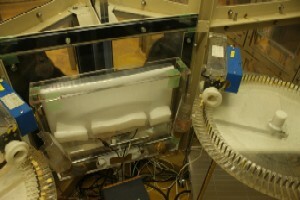 However, during a "ghost condition" (See video of ghost condition), when there was no other chimpanzee present, the mothers were faster(See Fig3). This suggests the children are better at paying attention to their mothers than the reverse scenario. This study introduced a novel paradigm for studying behavioral coordination in non-humans, able to yield insights into the evolution of turn-taking which underlies a range of social interactions, including communication and language.